Virginia is located in the Mid-Atlantic region of the east coast of the United States. The state is bordered by Washington, D.C., Maryland, West Virginia, North Carolina and Tennessee. The Northern Virginia region is the most populated and urban part of the state. Located in the center of the state is Richmond, the capital and an independent city. The eastern part of the state includes waterfront property along the Chesapeake Bay, the largest estuary in the United States, and Atlantic coastal communities including Virginia Beach and the Virginia Eastern Shore. The west and southern parts of the state have beautiful scenery and rural communities. Skyline Drive is a National Scenic Byway that runs 105 miles along the Blue Ridge Mountains. As one of the original 13 colonies, Virginia played an important role in American history. Jamestown, founded in 1607, was the first permanent English settlement in North America. Major points of interest include in the state include Mount Vernon, the home of George Washington; Monticello, the home of Thomas Jefferson; Richmond, the capital of the Confederacy and of Virginia; and Williamsburg, the restored Colonial capital. 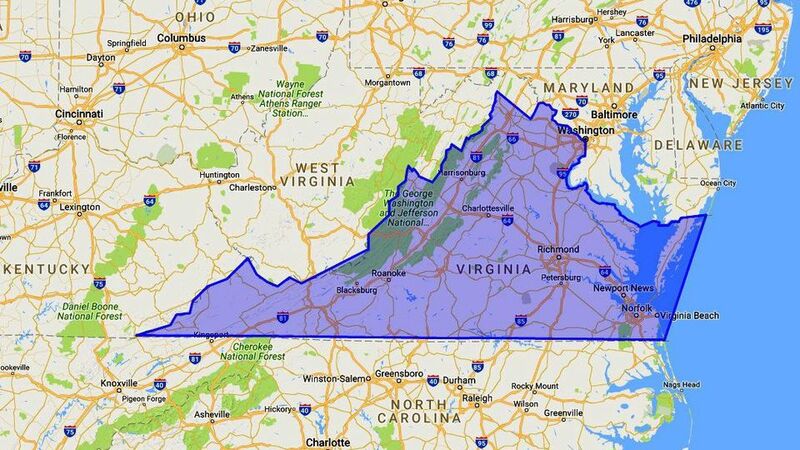 Virginia has a total area of 42,774.2 square miles. The state’s topography is very diverse ranging from the Tidewater, a coastal plain in the east with low marshlands and an abundance of wildlife near the Chesapeake Bay, to the Blue Ridge Mountains in the west, with the tallest mountain, Mount Rogers reaching 5,729 feet. The northern part of the state is relatively flat and has similar geological features to Washington, D.C.
Virginia's plant life is as diverse as its geography. Middle Atlantic coastal forests of oak, hickory and pine trees grow around the Chesapeake Bay and on the Delmarva Peninsula. The Blue Ridge Mountains of western Virginia are home to mixed forests of chestnut, walnut, hickory, oak, maple and pine trees. Virginia's state flower-tree, the American Dogwood, grows in abundance throughout the state. The wildlife species in Virginia are varied. There is an overpopulation of white tailed deer. Mammals can be found including black bears, beaver, bobcat, foxes, coyote, raccoons, skunk, Virginia opossum and otters. The Virginia coast is especially known for its blue crabs, and oysters. The Chesapeake Bay is also home to more than 350 species of fish including the Atlantic menhaden and American eel. There is a population of rare wild horses found on Chincoteague Island. Walleye, brook trout, Roanoke bass, and blue catfish are among the 210 known species of freshwater fish found in Virginia's rivers and streams.